4 chicken breasts washed and cut each fillet into 3 strips. Pour crackers, milk and cheese into 3 separate bowls. Dip chicken in milk, coat with the cheese pressing it on with your fingers, dip in crackers using fingers to make it stick. I found if you place the chicken in your palm then cover with cheese and crackers, turn over and repeat other side of chicken. Place in baking dish sprinkle with dried parsley. Cover baking dish with tin foil and bake in oven for 35 mins. Remove foil and bake a further 10 mins to really crisp and brown the chicken. 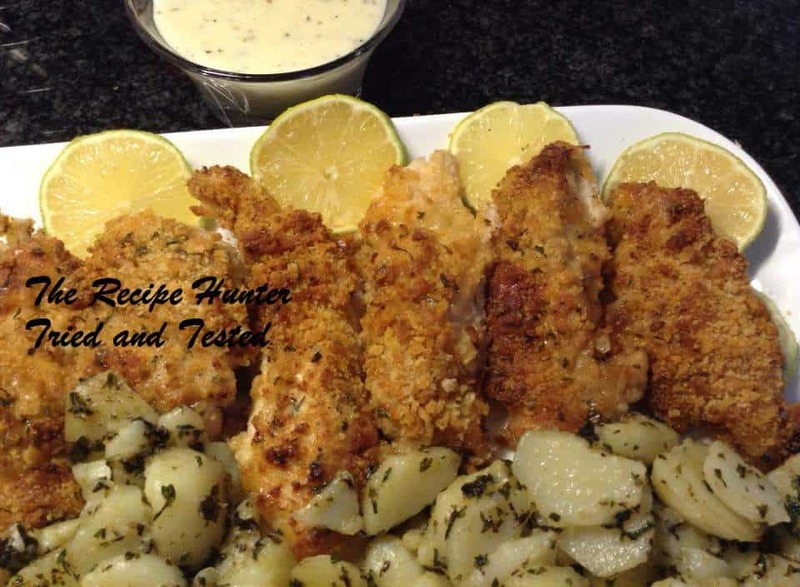 Serve with cheese and parsley sauce, green salad and sauteed spud potatoes.